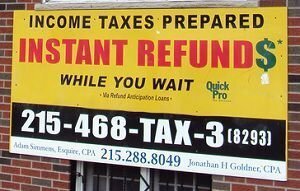 Home » Taxes » What are Refund Anticipation Loans? Tax preparation firms offer loans tied to the amount of your Federal or state tax refund so you can spend your refund as soon as your tax return is validated. These refund anticipation loans (RAL), also known as refund anticipation checks (RAC), can impose hefty fees and interest rates for the convenience of being able to spend the return quickly. Are these bad for consumers? After you file your taxes — or have them filed for you by a tax preparer — it can take 2-3 weeks to receive your refund back via direct deposit. However, an estimated 20-30% of Americans do not have checking or savings accounts. These tax payers have to wait on physical paper checks to arrive in the mail which can take much longer than the direct deposit method. If the tax payer is in a serious crunch for cash (or simply wants to spend that refund sooner rather than later), tax preparation companies offer a loan for the amount of the refund minus lending fees. The fees and APR interest rates associated with the refund anticipation loans are dependent upon the tax preparation firm that does your taxes. However, the fees can be very high when translated into a loan rate based on a year. A $30 fee might not seem like much, but on a small loan amount over a very short period of time (usually the 2-3 weeks until the Federal government sends out the refund) the APR is astronomically high. The tax prep firms make it sound simple because they take the money out of the refund you are owed so you pay nothing out of pocket. How Can I Receive a Refund Anticipation Loan? The tax preparation firm you use will only have certain options for their own firm. Some firms offer a check that you can pick up as soon as your return is accepted by the Federal government (which often happens within 24 hours of the tax return being submitted). Other companies offer a prepaid debit card that the money from the refund anticipation loan is put onto. Are Refund Anticipation Loans a Necessary Evil? Many consumer advocacy groups have spoken out against the high interest rates and fees of RALs and RACs. They argue that the loans are unnecessary, can be forced on uneducated consumers, and take advantage of low income families. While these points may be accurate, others argue that refund anticipation loans are a necessary evil in some instances. With a not insignificant number of Americans not participating in the banking system, taxpayers that can’t receive refunds either have to wait for the paper check in the mail or use a refund anticipation loan. The argument also follows that those same individuals will then have to pay check cashing fees which can come with the same high APR rates that the tax preparation firms charge for refund anticipation loans. Also, for taxpayers in a cash crunch, the flat fee that is taken out of the refund amount provides access to funds that are needed immediately. Paying $20, $30, or $50 to get a few hundred to a few thousand dollars seems like a small price to pay if the funds can keep the lights on or the rent paid.